I drove several Ford Cortinas in my time so it is with a little bit of shock that I learn the Mk2 series has been on the road for 50 years. For the record, I haven't been driving that long. 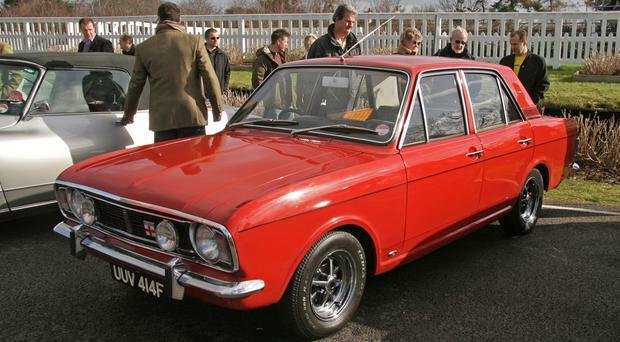 Yes, the Mk2 was rolled out in October 1966 at the London Motor Show. I am indebted to Jimmy Rafter, Secretary of the Cortina Owners Club of Ireland (COCI) for bringing it to my attention and for providing some of the history as its 50th birthday is celebrated. Anyway, the Club is celebrating the 50th anniversary milestone by encouraging members to bring their Mk2 Cortinas to as many shows as possible throughout the country this summer. Did you know the Cortina started out being codenamed "Project Archbishop" by Ford? It certainly got the public's blessing from its launch in September 1962 until yielding to the Ford Sierra in 1982. By which time it had clocked up nearly five million sales. Most of these cars were made in Dagenham, London, but some also at Ford's Marina plant in Cork. The thing about the Cortina was it could be most things to most people - as I remember well - from a 1200cc to a 1500GT version. The Cortinas I had in the 80s were gas guzzlers but the last one improved after I got the engine reconditioned. They were big, roomy and entirely practical motors. I remember that. There wasn't a lot of sophistication to some but I remember a few pristine, well-minded better-equipped models really looking the part in their day. The Mk1, Mk2, etc., designation arose because each model tended to last for around four years. There was usually a mid-range face-lift as well. The Mk2 was much blockier/squarer than the Mk1 but kept the Kent engines, original floor pan and chassis of its forerunner. It was a bit better to drive too because they improved the suspension and it had wider track. It's interesting to look back now at the initial model and trim levels: Base, De Luxe, Super and GT and Lotus. Early into Mk2 production, Ford turned the Kent engine into a "crossflow" design which made it more powerful and less thirsty. The Lotus version won the likes of the Scottish Rally in 1967 with Roger Clark, as well as doing well in African safari rallies and on the Touring Car circuit. The iconic Mk2 1600E was introduced in September 1967 at the Paris Motor show. As Jimmy Rafferty says: "Basically, Ford took a four-door GT Cortina and gave it Lotus suspension, a new plush interior with deep-pile carpet, detailed instrumentation, a walnut dashboard and door cappings, full chrome Rubery Owen-designed Rostyle wheels, twin Wipac spot lamps, a hand-painted coach line, rear-C-pillar motif badges and a blackened front grille. It cost £982, making it £86 less than the Lotus and it sold like it was going out of fashion." In 1970 each member of England's World Cup panel was given a 1600E by Ford of Britain. And then there was the Mk3 Cortina in August 1970. But that is for another day.